West Woodland neighbor Julia Courtney is hosting a ‘Shoeboxes of Joy’ assembly party on Sunday, November 27, 2016 from 1:00 pm – 5:00 pm at 1120 NW Ballard Way (Captain’s Nautical Supplies). 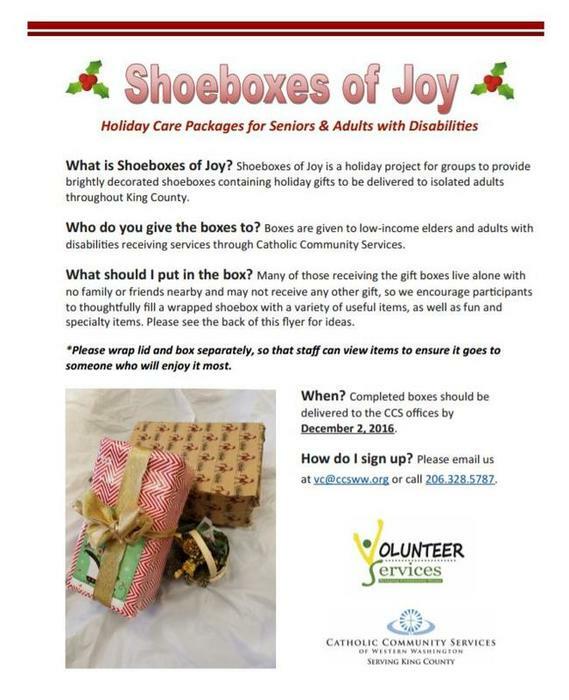 Shoeboxes of Joy is a holiday program put on by Volunteer Services which provides holiday gifts for low-income elders and adults with disabilities receiving services through Catholic Community Services. Many of those receiving the brightly decorated shoeboxes live alone with no family or friends nearby and may not receive any other gift. Organizers are asking that the boxes be full of quality items, examples include: postage stamps, prepaid phone cards, grocery (or other) gift certificates, small flashlights, night lights, batteries, calculators, disposable cameras, stationary, scarves, gloves, toiletries, playing cards, calendars, and food items. Theme boxes can also be fun and are appreciated, i.e. disaster preparedness, diabetic or cancer patient boxes, and male or female boxes. Julia shared that if neighbors are not able to make it to this event, she is happy to take donations of empty shoeboxes, donated holiday wrapping paper, or items to be included in the boxes. 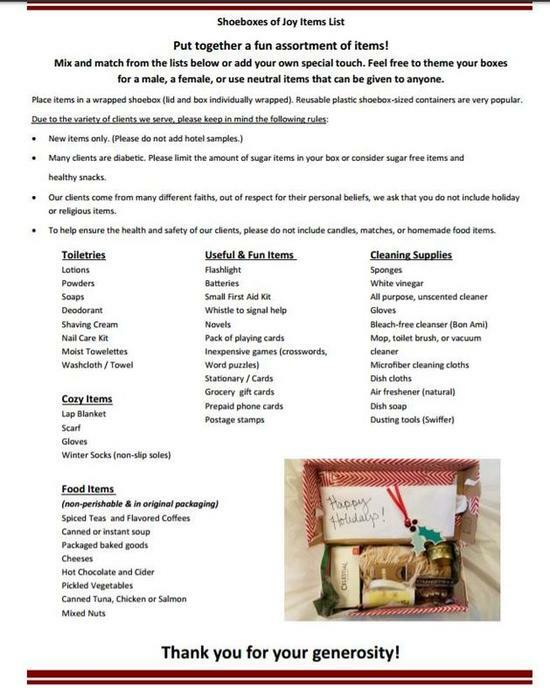 Donations need to be delivered to their offices by Friday, December 2. Please contact Julia at JuliaMCourtney@gmail.com for additional information.